Feb. 1694, erecting his lands into the regality of Grant, m. 1stly (contract 21 Dec.
1671), Janet (d. 1697), only child of Alexander Brodie, of Lethen (see that family). Baronetcies). He was bur. 19 Nov. 1714. ALEXANDER GRANT, 2nd of Grant, Brig.-Gen. in the Army, Lord Lieut. 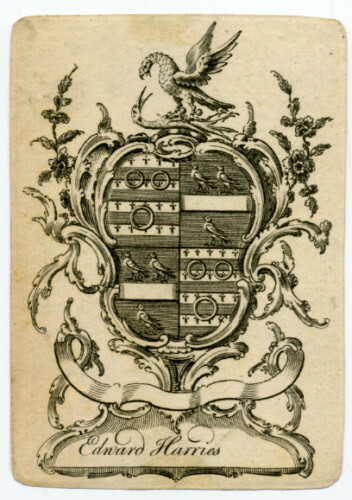 cos.
From the above we can deduce that the bookplate dates from between 1694, when the lands were erected into the regality of Grant, and the death of his father in 1714. 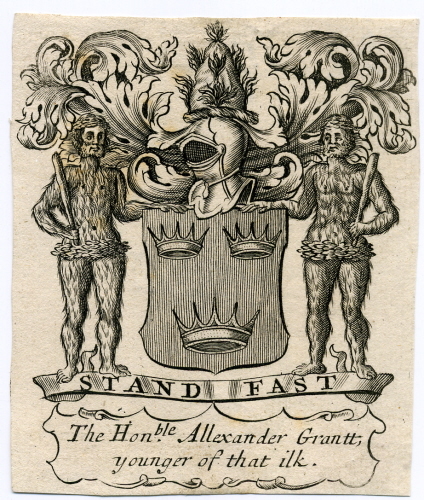 Anthony Pincott advised that the bookplate is nearer 1705-1710. The power of Google also reveals that Alexander Grant was one of those who voted in favour of the Union with England in 1707. Arms: Quarterly 1st & 4th Barry of eight ermine and Azure three annulets Or (for Harries) 2nd & 3rd Azure a fess between three falcons close Argent beaked and legged Or (for Philips). Crest: A hawk Argent beaked and belled Or preying on a pheasant of the first. This is the livery button of the Rev Thomas Miller DD of Cumnock, Scotland as recorded in the Lyon Register in 1814. Arms: Sable a cross Moline Argent a chief of the last. 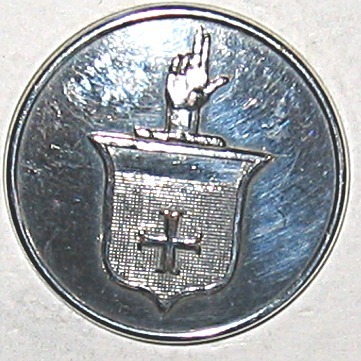 Crest: A dexter hand with the first and second fingers pointing upwards proper. Motto: Spei bonae atque animi (Of good hope and courage).